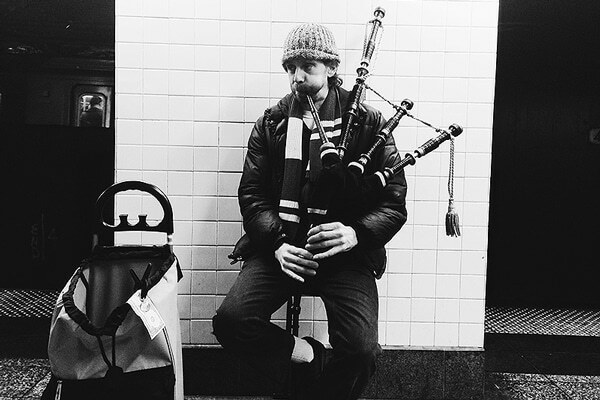 There’s something that has just always seemed tragically lonely about NYC subway musicians. Making music is (or seems) to be an inherently social activity – something we do with, and for others – and yet most buskers perform by themselves. This isn’t unusual of course, there are many people out there who identify as “solo musicians.” But the busker seems to amplify the solitude of the artist… whether it’s because s/he is playing underground, or because their donation tray that sadly usually only contains a couple of dollars (if that), revealing the fact that most people are unable to connect with the interior space that the artist inhabits or that, more probably, they just don’t care. As I started recording some of these artists (and always paying them to do so), I began to realize that, in fact, these artists weren’t playing entirely alone, in many cases they were creating these incredible duets with the sounds of the trains, the echoes, and even with the people who were ignoring them. I started wondering what it would sound like if some of these artists *could* play together…. I concocted an imaginary installation in which buskers from all over New York (or maybe all over the world?) were mic’d and their music broadcast to each other so that they could all play in a continuous, 24-hour jam in real time. Logistically, I’m not sure how this would work, but it would be an interesting experiment – maybe start with 2 or 3 just in New York, and then gradually scale up to include many others. Anyway, this piece is simply a meditation on that thought…. Thank you to Moonshine Shorey for providing the vocals. As always, please listen with quality headphones if available.